Religion vs conservation: When will pilgrims stop polluting our forests? It’s festival time at a temple. Hordes of people in colourful clothes mill about, gaily lit shops sell souvenirs and articles for rituals, while itinerant vendors sell cheap plastic toys, religious posters, snacks, and assorted other merchandise. Discarded plastic bags, wrappers and shards of glass lie strewn underfoot. Nearby trees bear fresh injuries, their missing limbs going up in smoke in make-shift wood stoves. Detergent from washing laundry and human excreta pollute pools and streams. Loudspeakers from the temple blast religious music while people hold high decibel conversations. Where pilgrims are allowed to drive right up to the shrine, the road is littered with dead fauna. Traffic’s bright headlights blind the animals and then mow them down. Within a couple of days, people decamp just as suddenly as they arrived and a pall of silence descends like a heavy curtain. Birds and animals that abandoned the temple site when the attack of humanity began will slowly return over the following days and weeks. The stench of human excreta will take six weeks at least to dissipate. This is a generic experience of a festival celebrated in temples located in many of our forests. While this is a seasonal menace in some wilderness areas, in others it’s a year-round nagging problem. No matter what category of protection these wild areas enjoy, they are at the mercy of invading mobs on religious red-letter days. Instead of being on the look-out for poachers and fires, forest staff regulates pilgrims and their activities. See this article in the Times of India for an account of the impact of pilgrim tourism on Bhimashankar Wildlife Sanctuary, Maharashtra. After pilgrims leave, conservation organizations, schools and colleges help forest authorities clean up the mess in some places. Over the last six years, the Ashoka Trust for Research in Ecology and Environment (ATREE), a conservation NGO, coordinated garbage removal from Kalakkad-Mundanthurai Tiger Reserve’s Sorimuthian temple, Tamil Nadu. In 2010, a large volunteer group of school children and college students cleaned up the temple site of one ton of trash accumulated over a ten-day period and trucked it to Tirunelveli, the nearest large city for recycling. Although the shrine occupies only 21 hectares, visitors camp on the surrounding 500 hectares of “hallowed grounds”. But their presence is felt for a radius of 4.5 kilometres from the temple, an area of 6,320 hectares. Soubadra Devy and her team from ATREE conduct good-behaviour campaigns, and search-and-confiscate plastic and alcohol before pilgrims enter the forest. They also lobby with authorities to build more toilets and ban driving through the forest at night. Even so, the future of a spurge (Euphorbia susanholmesiae), a thorny tree that grows on rocks, is dangerously threatened by pilgrims’ activities. Not only do they use it for fuel but they also clean rocks of dirt crucial for the tree’s survival. Ironically, this species, first discovered by science at this very spot almost two decades ago, is so severely affected that it may need to be fenced off, even in this protected forest. While pilgrims clear the understorey to create campsites and park their vehicles, they also set off accidental fires. There is no re-growth of forest around the temple. During festival season, there is a five-fold increase in transport traffic. In 2010, the wheels of these devotee-carrying vehicles ran over 1413 animals of 53 species, mostly invertebrates like millipedes, scorpions, and centipedes, reptiles like chameleons, snakes and turtles, amphibians and other small animals. This mortality was 300 per cent more than non-festival days. Animals also die of intestinal impaction from mistakenly eating plastic. 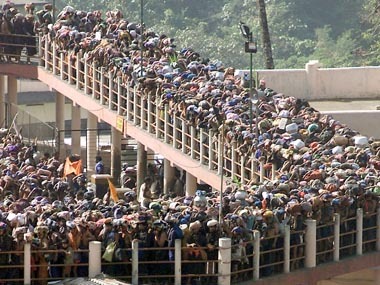 One of the largest forest temples in the country is Sabarimala in Periyar Tiger Reserve, which receives more than 50 million people over 60 days. Assuming each human produces about 150 grams of poop a day, that’s 9,000 metric tons. Even with 300 toilets, those septic tanks are woefully inadequate and fill up within a few days. Where does the excess go? Dumped in the River Pampa. At peak season, the State Pollution Control Board recorded the river’s coliform content at 1,14,000 per 100 millilitre in the year 2010. In comparison, the permissible level is 500 per 100 millilitre. At Sorimuthian Temple in Kalakkad-Mundanthurai Tiger Reserve, the Kani tribals, who rely on the River Karaiyar for their consumption needs, are incapacitated by jaundice for weeks after the July-August festival. Neither pilgrims nor temple authorities seem concerned by the defilement, even though they revere the presiding gods. Temples located deep inside forests began life as simple, sometimes primitive, structures. Traditionally, the renunciation of comfort during pilgrimage was considered a form of offering to gods. But modern-day religious tourism makes these sacred sites no different from numerous large temples in cities and towns across India. While State Forest Departments try to limit and control the damage, they are confronted by apathetic, sometimes hostile, temple administrations. With pilgrims exponentially increasing in numbers every year, can forests be protected against these religious hordes? While these very same parks limit the number of nature tourists, all such controls are off for those visiting temples. There is no policy on managing this sector, either at the ministry level, or at the state or park level. These visitors don’t figure in the gobbledegooky discussion of tourism carrying capacity in the draft ecotourism guidelines for National Parks and Sanctuaries issued by the Ministry in June last year. The authorities are not only hesitant to tackle anything religious, they actively condone some temples’ illegal constructions and expansions. See an account of a mahotsava held earlier this year in Bandipur Tiger Reserve that flouted wildlife laws in the Deccan Herald. This is not an exception. In some cases, even hotels have sprung up in the temples’ shadows. Renee Borges, an ecologist from Indian Institute of Science and Ulhas Rane, an architect of Envirodesigners Pvt. Ltd. drafted a preliminary ecotourism management policy for Bhimashankar Wildlife Sanctuary. Under the supervision of the Forest Department, local tribal communities will ensure that tourists follow regulations such the ban on plastics. Pilgrims will park their vehicles at the Sanctuary gate and travel to the temple in non-polluting mini buses or on foot accompanied by local guides. Residents will earn income from selling articles needed for performing rituals at the temple, and forest and agricultural produce. In addition, all eight forest villages will provide home-stay facilities for visitors. The policy also seeks to create ecological and social awareness among tourists. More than the increasing number of visitors, Borges and Rane feel it’s the anti-environment attitude of visitors and temple administration that is a cause for concern. There is no doubt more needs to be done to change these attitudes towards conservation and environmental prudence. While curtailing tourism development to the edges of sanctuaries will improve this dismal situation, it will not lessen the pressures of high numbers of people on the forest. For instance, problems of noise and air pollution, and solid waste management increase exponentially when more humans enter a wilderness area. Keeping pace with their increasing clientele, temples want more and more forest land to provide better facilities which in turn attracts many more pilgrims. Sometimes, devout politicians bring tremendous pressure on the forest authorities to accede to the temples’ demands for additional land. We need to put the brakes on now and limit pilgrim numbers before they totally overrun our parks. Ecologist Jayashree Ratnam suggests a lottery model of limited entry like the one in force for Kailash Manasarovar in Tibet. Borges and Rane’s suggestion of a private vehicle ban inside forests will limit the damage to some extent. Soubadra Devy’s surveys show that many exploit the festival’s free entry to camp in the forest. Charging a fee would definitely discourage such free loaders. The conservation community, sanctuary authorities, temple managements and the ministry have to come up with solutions to this management problem plaguing many of our reserves. Forest shrines were venerated for peace, tranquility and wildness, and to aid their devotees achieve a higher state of spirituality or consciousness. Let’s not bring the city to the wilderness and spoil the very reason for these temples’ existence.